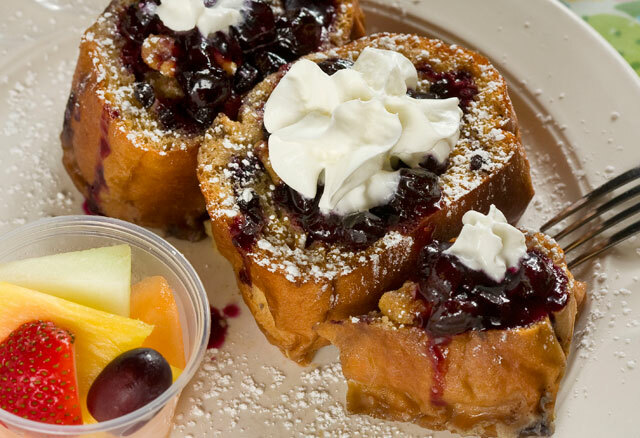 A beloved gourmet eatery for breakfast and lunch, The Cary Café is known for serving up exquisite provisions like lemon buttermilk pancakes with peach syrup, omelets filled with feta, spinach or Brie and a to-die-for baked blueberry walnut French toast (see photo below). It’s all scratch-made daily by owners Abdul and Vicky Ismail, who opened the café in 1995. Even the maple syrup is homemade. It’s that kind of attention to detail that keeps the locals coming back time and again. Be sure to try the robust java, which is sourced from local roaster Tradewinds Coffee Company. While breakfast is served all day six days a week (the café is closed Sunday), at lunchtime you can also choose from among a tempting selection of specials such as chicken pot pie filo wrap; ginger-glazed poached Norwegian salmon over fresh greens; and a quiche of the day. The menu also features a nice variety of sandwiches, salads and soups. If you have a hard time choosing, go for the signature chunky chicken salad. It ranks among the best in the Triangle. The café’s sunny, inviting dining room, lively atmosphere and conscientious service make for a rewarding experience. Local artwork is showcased regularly. The Cary Café is located at Harrison Pointe Shopping Center at the corner of Maynard and Harrison.